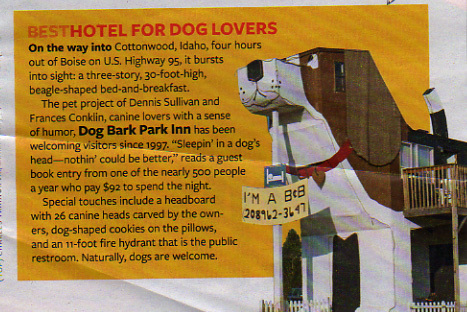 Sweet Willy, our pet name for Dog Bark Park Inn Bed & Breakfast, was named Best Hotel for Dog Lovers in the July 2009 annual Best of America Reader’s Digest magazine. Find Sweet Willy’s picture and commentary on page 77 . The Best of America article celebrates some of the people, places, and ideas that typify the strength, spirit and goodness found in America. Since April when an editor from the Digest phoned to confirm facts about Dog Bark Park we have been eagerly awaiting word of the article’s publication. Even before the magazine hit the national newstands last Wednesday we began receiving phone calls & e-mails from Digest subscribers. One kind reader scanned the article & sent it to us a few days ago since copies hadn’t yet arrived at the newstand in our rural grocery store. Thank you Joyce & Herb!